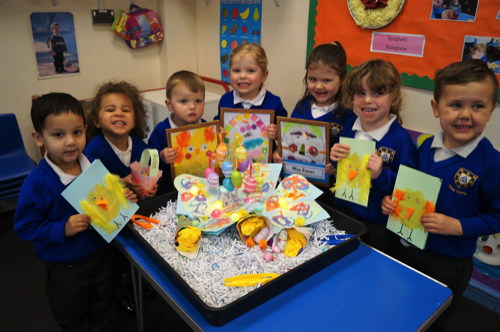 It’s all paint, glue and colour at Little Trinity Nursery in Kidderminster as the nursery gets ready to celebrate Easter. The children ranging in ages from 2-years to 4-years are busy making cards, Easter baskets and nests and taking part in fun Easter egg hunts wearing their rabbit headbands and drawing pretty patterns on eggs and playing dozens of Easter egg-themed games including number matching eggs and of course enjoying the ever-popular egg and spoon race! With the Easter break drawing near, and weather permitting, the children will be spending lots of time outside having Easter-themed fun, in and around the nursery’s outside garden and activity play areas.